The State of the U.S. Online Retail Economy in Q3 2016 has just been released from ComScore. Q2 and Q3 both had especially strong year-over-year growth rates, despite an uptick in negative sentiment. Full employment, wage growth and low gas prices all provide a base for a strong Q4. Mobile retail visits grew strongly year-over-year; however, mobile apps are driving an increasing amount of retail activity, which tends to favor the large established brands like Amazon and Walmart. M-commerce hit 20% of digital commerce spend for the first time ever in Q3. 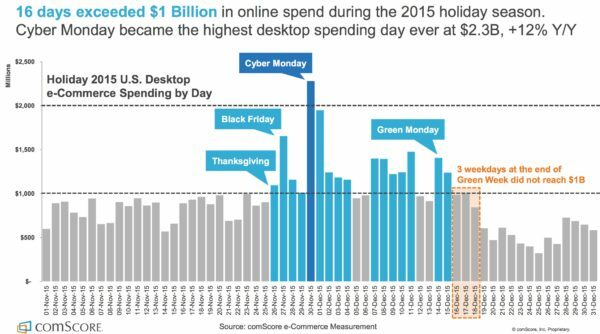 Black Friday has become a huge day for mobile retail, and it could potentially surpass Cyber Monday this year for digital traffic. Cyber Monday is predicted to surpass $1 billion in mobile sales for the first time and once again become the heaviest online spending day in history for the 7th straight year. To learn more details, please contact us.